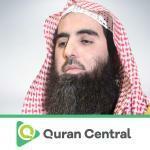 Muhammad Al-Luhaidan is based in Saudi Arabia, and enjoys an excellent reputation of being a renowned Qur’an reciter. In addition to this, he is also a judge by profession. A patron and scholar of Tayyibun Foundation, he is presently the Imam of Jamia al Nasir Masjid in Riyadh. Having participated in numerous Islamic conferences and events in many countries including Turkey, Australia, and Malaysia, Kuwait as well as the Tayyibun Annual Conference in London 2011 and 2012, he is a role model of budding Islamic enthusiasts.